Peppercorns, and the powdered pepper derived from grinding them, may be described as black pepper, white pepper, red/pink pepper, green pepper, and very often simply pepper. It can be used in almost every dish except sweets, although it is used in pfeffernusse in Germany. They are a fruit (piper nigrum), growing in clusters of 50 on a vine plant. They are picked at various stages to get a white, black, or green peppercorn. These different colored peppercorns are also different in flavor. Black has a hot, spicy flavor that suits most savory foods. White is lighter in heat and is good for use in lighter colored dishes. Green has a more fresh taste and is less pungent than black or white. 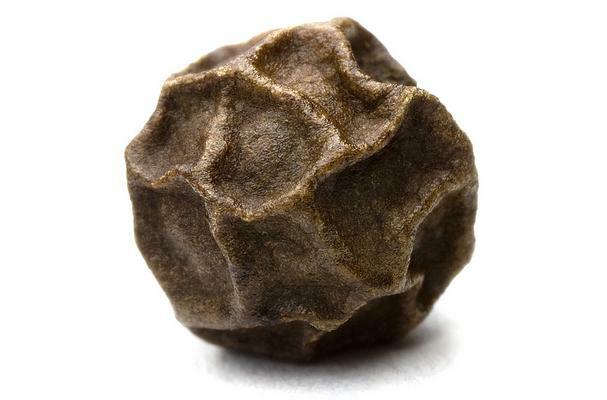 It is best to buy whole peppercorns to get the best flavor after grinding. Pepper grinders are widely available. Peppercorns used to be very valuable, it was practically legal tender in the medieval ages. Now, nearly ever culture uses peppercorns. Bumpy, small, and rough in texture. Colors: Can be black, red, green, or white. Buying: Can be bought at any grocery store or large retailer like Walmart. Procuring: Peppercorns come from the flowering vine of Piperaceae. Pepper most commonly comes from India. Peppercorns can be used whole or crushed in a grinder and sprinkled on food. Cleaning: No need to clean peppercorns. Store peppercorns in a container at room temperature.